When I first laid eyes on this superhet I knew that it was a very early one. It had 3” main tuning dials, all the binding posts were on the front panel, and it had little windows on the front panel for viewing the brightness of the tubes. I’ve never seen another 20s superhet built with these windows. The windows are a good indication that the radio was designed for early 1-amp filament UV-201 tubes with the clear glass, instead of the later .25-amp UV-201A tubes with the silvered glass. It is indeed a very early radio. However, my first impressions about the dials were wrong, because the dials are actually 4” in diameter. It was just an optical illusion because of the large size of the radio. The front panel measures 36” long by 8” high. I purchased the set out of Belmont, Massachusetts. Here is an inside angle view of the set. 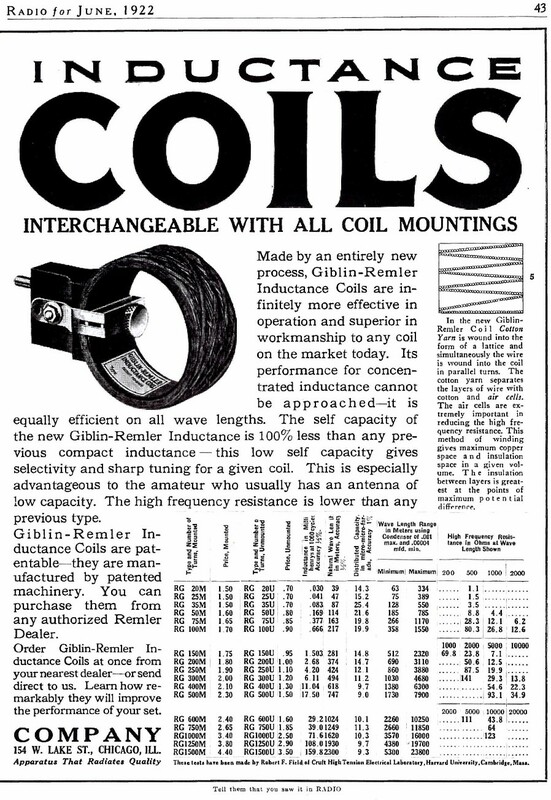 All of the RF coils are plug-in Giblin-Remler duo lateral coils. I don’t actually know who designed or manufactured the radio. However, I think that it was professionally manufactured. I call it a Giblin-Remler because the oscillator coupler and the IF transformers are made with Giblin-Remler coils. The oscillator coupler is made with a Type 50 for the grid coil, a Type 75 for the plate coil, and a Type 35 for the pickup coil. The first three IF stages have a Type 300 for the primary and a Type 750 for the secondary. The last IF stage has a single Type 750 for the plate coil, and the plate is RC coupled to the second detector. The entire IF amplifier and the second detector are enclosed in a copper shield. 1. Most of the circuit is a standard 1920s superheterodyne (there are some quirks that will be described a little later). 2. The front engraved panel measures 36” long by 8” high by .25” thick. 3. Giblin-Remler oscillator coupler and IF transformers. 5. Federal and General Radio audio transformers. 6. Federal No 16 tube sockets. 7. I can’t see a manufacture name on the rheostats. Close up view of the oscillator and the first detector. The IF amplifier section with the top of the copper shield removed. Each stage is shielded one from the other. The professional manufacturing technique is evident throughout the entire radio. Close up view of the audio amplifier. I don’t know why the builder chose to use two different brands of audio transformers, or the logic of using one before the other in the circuit. It doesn’t look like either transformer has ever been replaced. Close up view of one of the Type 750 Giblin-Remler inductance coils. Close up view of the engraved panel. Hand drawn schematic diagram of the Giblin-Remler superheterodyne. This is a very early circuit. The second detector is RC coupled in a similar fashion as my so-called Armstrong superhet. Other early indications are the fact the set has no stability control for the IF amplifier and there is no provision for a C bias battery. The set does not have a regenerative first detector (which became very popular and was probably invented in 1924). Every tube has its own rheostat control on the front panel. All of the parts comprising this superhet were probably available in 1922. The radio could have been made in 1922, but I suspect that it was made in 1923. 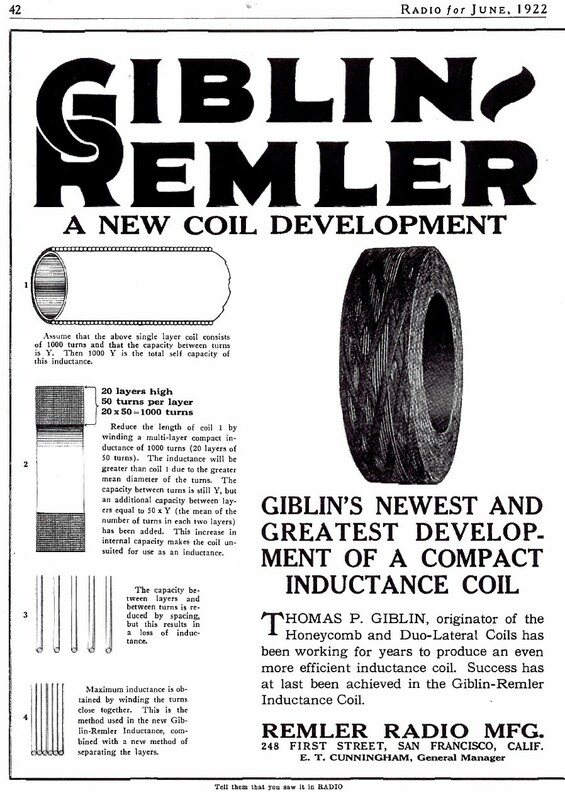 Arthur B. McCullah described a superheterodyne using Giblin-Remler coils in the April, 1924, Radio Age magazine. The McCullah superhet had more refinements than my superhet, including tuned secondary coils in the IF amplifier, a stability control for the IF amplifier, a C battery for the audio amplifier, and the tubes in the IF amplifier shared a single filament rheostat. The circuitry of my Giblin-Remler superhet should predate the McCullah superhet. The table below records the pass band frequency response of the various stages in the IF amplifier. The first three stages of the IF amplifier were configured as air core transformers and they all had similar characteristics. The primary coils were shunted with a .001 mfd capacitor (the measured values were .00067 mfd, .00064 mfd, and .00085 mfd). The inductances of the primary coils measured about 6.3 millihenries, which should produce resonant frequencies of 77 KC, 79 KC, and 69 KC). Because of the close coupling of the primary and secondary, the transformers were actually producing two peaks, a smaller peak at about 75 KC and a larger peak at about 125 KC. Why wasn’t the larger peak closer to 70-80 KC? I don’t know for sure, but it could be that the secondary coil has a resonant frequency of itself by virtue of the secondary inductance and its self capacity, which is more pronounced than the resonant frequency of the primary. The fourth stage was different than the first three stages, having a plate tuned circuit only, and RC coupling the plate to the grid of the second detector. The inductance of this coil is larger than the inductance of the primary coils of the first three stages, and it should have a smaller capacitance in shunt to get the correct resonant frequency. This capacitor is physically different than the other IF transformer capacitors and there is no visible value marked on the capacitor. The capacitor will not measure on my Sencore LC53 capacitance meter (indicating a bad capacitor). It does not register any leakage current on the LC53 either. However, the capacitor must have a relatively large RF leakage, and it is probably responsible for the very wide frequency response of this stage. The two scans above show a Giblin-Remler advertisement in the June, 1922, Radio magazine. It is possible that Victor Grriff designed this “Type S.H. 8” Giblin-Remler Super-Heterodyne as a prototype for his Receptrad Type SH8-1 Super-Heterodyne of 1924. Besides the obvious name connection, the Receptrad looks a lot like the earlier Giblin-Remler. The Receptrad has a much more refined circuit than the Giblin-Remler. Check out this LINK for a comparison to the Receptrad.